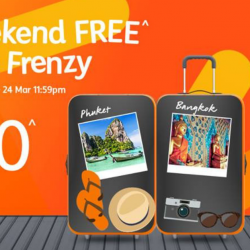 Book by 3 Feb 2019 Jetstar: Weekend Fare Frenzy Sale with All-in Sale Fares to Bangkok, Bali, Jakarta & More from SGD51! It's been a while, but Jetstar's Weekend Fare Frenzy is back to spice up your travels! Grab sale tickets to Penang, Phuket, Bangkok, Denpasar and more from $51! Sale ends Sunday 3 February 11pm SGT, so hurry and book now! 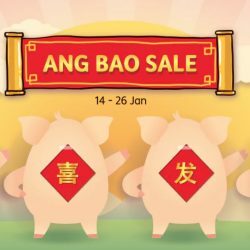 14 - 26 Jan 2019 Jetstar: 12-day Ang Bao Sale to 12 Destinations from SGD8+++ One Way! Huat ah! 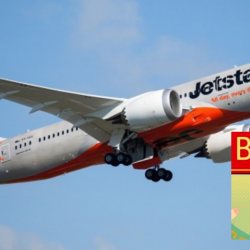 The Jetstar 12-day Ang Bao Sale is now on! Fly to your auspicious destination for luck improvement from as low as S$8+++ one way! From 14 to 26 January, a new sale destination will be revealed each day at 10am SGT, alongside a corresponding zodiac sign. So far, 3 destinations - Bali, Phuket and Phnom Penh have been revealed so keep updated at Jetstar's FB page to grab the sale fares to your dream destination! 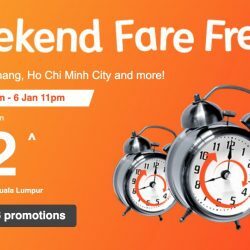 Book by 6 Jan 2019, 11pm Jetstar: Weekend Fare Frenzy to Bangkok, Penang, Ho Chi Minh City & More from SGD52! Happy first Weekend Fare Frenzy of 2019! Don't miss these great SALE fares from Jetstar for your first getaways of the year! Sale ends 6 January 11pm SGT, so hurry and book now! T&Cs apply. Don't miss the amazing 12.12 Return for FREE sale at Jetstar! Book a flight to any of the 21 destinations and return for FREE! Book now before sale ends 16 December 2018, 2359hrs. 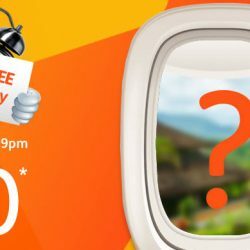 Book by 30 Nov 2018 Jetstar: 100,000 FREE Seats to Bali, Taipei, Bangkok, Hong Kong & More Up for Grabs! Here's your FREEdom to fly! 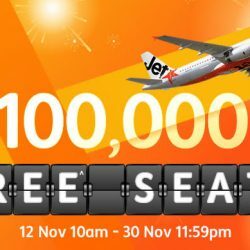 100,000 FREE Jetstar seats to over 20 destinations for travel on or after 2 Jan 2019 are now on SALE! 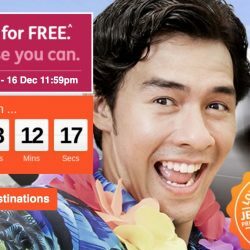 Hurry and book now at jetstar.com/sg/en/deals/free-seats! 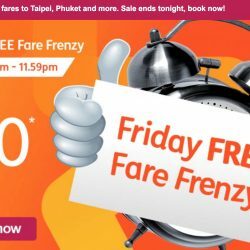 Book by 12 Oct 2018, 11.59pm Jetstar: Friday FREE Fare Frenzy with $0 Fares to Taipei, Phuket, Surabaya & More! Jetstar's Friday FREE Fare Frenzy S$0 (base fare) destinations on SALE now, book at jetstar.com/sg/en/deals/friday-free-fare-frenzy! Fly to Medan, Shantou, Phuket, Taipei and more for $0 before taxes! Please note that S$0 promotional fares on the booking system will display as either S$47.30, S$49.80 or S$49.36 due to taxes and fees. Sale ends Friday 12 October 11.59pm SGT, so hurry and book now! 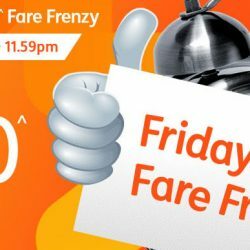 5 Oct 2018 Jetstar: $0 Friday FREE Fare Frenzy is back from 9am! Celebrate Friday with $0 fares for the month of October at Jetstar! Starting 5 October for four consecutive Fridays, different destinations go on sale at $0, so don’t miss out on your favorite destination when you see them on sale! Book by 1 Oct 2018 Jetstar: Irresistible Sale Fares from SGD53 to Indonesia! Bali on sale now from just $59 one way all-in on Jetstar! Selamat Datang ke Indonesia! Other Indonesia destinations on sale include Palembang, Pekanbaru, Jakarta, Medan & Surabaya! Early access for Club Jetstar members is now on till 28 September 8.59am so hurry and book now at jetstar.com/sg/en/club-jetstar/club-jetstar-deals! Non-Club Jetstar members can also sign up to book these fares immediately, don't miss out! Public can book from 28 September, 9am to 1 October, 11.59pm! 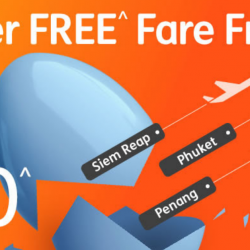 Book by 23 Sep 2018 Jetstar: Fly to Hong Kong, Phuket, Jakarta, Penang, Sanya & More from only SGD51! 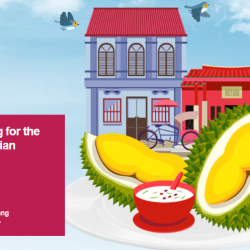 Fly to Hong Kong for the price of a box of mooncakes at only SGD59 or to Penang for the price of a durian at only SGD51! 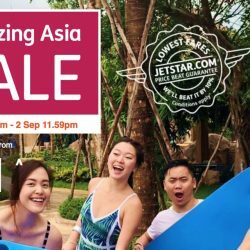 Get your sale tickets at Jetstar.com from now till 23 September 2018 or till all tickets are sold out! 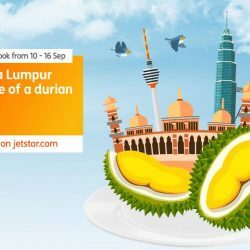 Book by 16 Sep 2018 Jetstar: Irresistible Sale Fares to Kuala Lumpur, Ho Chi Minh City, Bangkok, Okinawa & More from just S$49! Durian or Kuala Lumpur? Durian in Kuala Lumpur? Durian for Kuala Lumpur? Only S$49 one way all-in to KL so book now at jetstar.com/sg/en/deals! Also on sale are your favourite destinations like Kuala Lumpur, Ho Chi Minh City, Bangkok, Taipei, Okinawa and more! Sale fares are limited so hurry and book now at jetstar.com/sg/en/deals! Sale ends 16 September 11.59pm SGT. Book by 2 Sep 2018 Jetstar: Explore Asia with Amazing Sale Fares to Sanya, Okinawa, Bangkok & More from S$51! Explore Amazing Asia with these awesome all-in fares, up to 57% off, only at jetstar.com/sg/en/deals! Sale ends Sunday 2 Sept 11.59pm SGT, so hurry and book now! 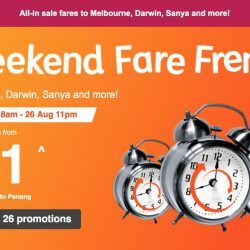 Book by 26 Aug 2018, 11pm Jetstar: Weekend Fare Frenzy with Year-end Getaways to Penang, Melbourne, Darwin & More from SGD51! The Weekend is Finally here! Get your hands on these all-inclusive Fantabulous Fares now, up to 60% OFF! All destinations are on SALE, only at jetstar.com! Sale ends Sunday 26 August 11pm SGT, so hurry and book now at jetstar.com! 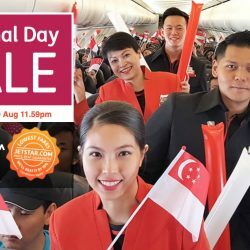 It's exactly a week to Singapore's 53rd National Day, and Jetstar is celebrating with a SALE for everyone, only at jetstar.com! 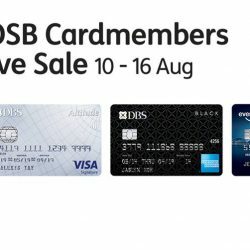 Sale ends Thursday 9 August 11.59pm SGT. 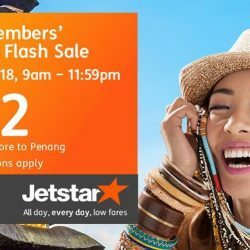 Book by 22 Jul 2018 Jetstar: Jaw-Dropping Sale with Sale Fares to Taipei, Okinawa, Bali, Penang & More from SGD50! Jetstar's JAW-DROPPING SALE is ending tomorrow, so hurry and book now at jetstar.com to grab special fares from $50! 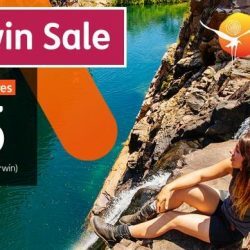 Book by 29 Jun 2018 Jetstar: Fly to Darwin from S$75 One Way All-In! See the adventurous side of Australia, from as low as S$75 one way all-in, only at jetstar.com/sg/en/deals! Darwin, just a 4.5 hour flight, is the shortest connection between Singapore and Australia. Also known as the Northen Territory, Darwin is home to the "best sunset in the world" at Mindl Beach and the fun Crocosaurus Cove. Drive further out to Kakadu National Park and experience awe-inspiring sights such as the Gunlom Plunge Pool, Jim Jim Falls and Twin Falls Gorge. 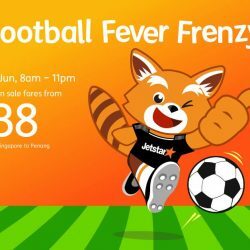 Book by 15 Jun 2018, 11pm Jetstar: Football Fever Frenzy with All-In Fares to Sanya, Bali, Penang & More from SGD38! It's Football.....Fare Frenzy time so make sure you score that awesome fare to up your travel game, only at Jetstar! Sale ends Friday 15 June 11pm SGT, so hurry and book now at jetstar.com/sg/en/deals! 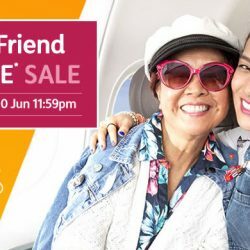 Book by 10 Jun 2018, 2359hrs Jetstar: Take a Friend for FREE Sale to Taipei, Bali, Yangon, Sanya, Darwin & More! Take a Friend for FREE on your next holiday! 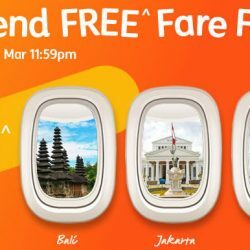 Jetstar is bringing their Take a Friend for FREE sale to Taipei, Bali, Yangon, Sanya, Darwin, Ho Chi Minh City, Darwin and more! Book by 10 June 2018, 2359hrs.